We all have fond memories of brightly colored Paas Easter eggs, but this year think outside the carton and get creative with your egg decorating methods. A variety of techniques (including decoupage, doodling, and even needlework) and an array of materials (from stamps and beads to napkins and glitter) can be used to put a fresh spin on this quintessential Easter decor. With these original and eye-catching beauties, you’ll be Peter Cottontail’s favorite house on the block. 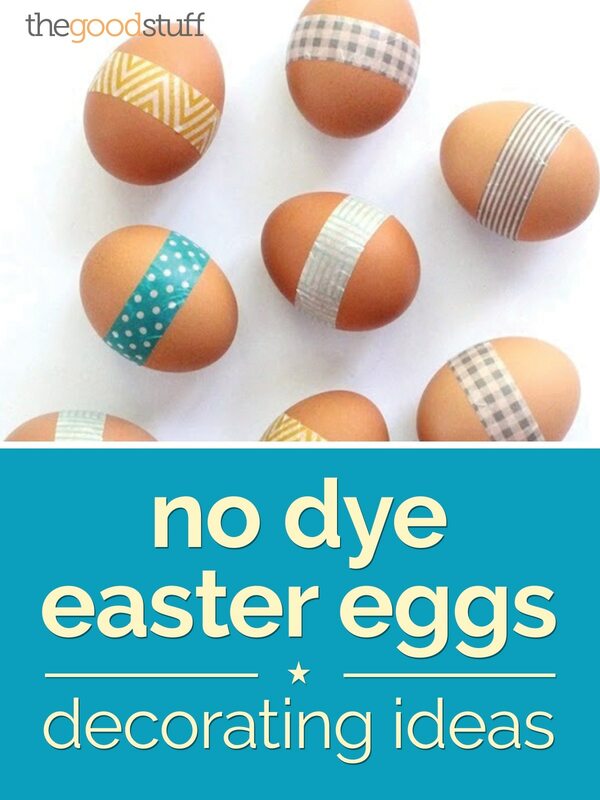 Here’s a great roundup of no dye Easter eggs that you can easily create! Decorate a dozen eggs in minutes with this simple technique. 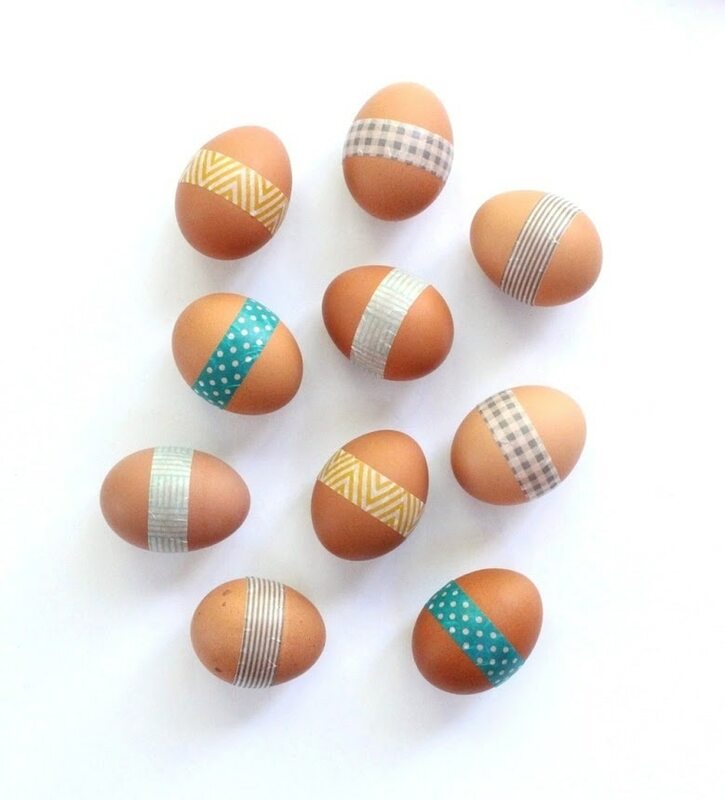 Just wrap colorfully patterned washi tape around the middle of hard-boiled (or fake) eggs. 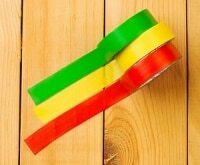 Overlap about a ¼” inch at the ends, cut the tape, then rub out wrinkles with your fingernail as much as possible. You could use a soft palette against naturally brown eggs, or opt for pops of bright color against plain white eggs. Check out this full list of Easter Egg Washi Tape ideas for more inspiration! Bling belongs everywhere, the Easter table included. 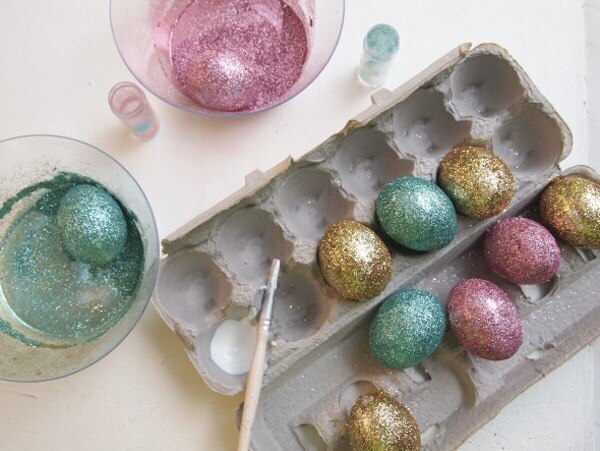 To make these shimmery eggs, thoroughly coat them with glue, dip in glitter, shake of excess, and let them shine. 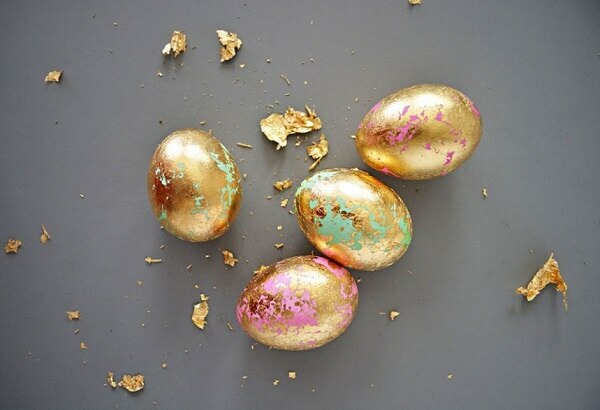 These elegant eggs take some careful maneuvering to create, but are well worth the effort. 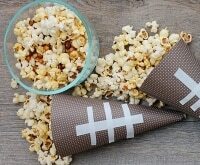 To make them, blow out the contents of an egg and cover the hollow shell with a prettily patterned napkin (or tissue paper) using decoupage glue. Let the heat from freshly boiled eggs do the work for you. Simply sprinkle on bits of crayon and watch them melt into abstract swirly patterns. It’s official: there’s nothing you can’t decorate with a Sharpie. 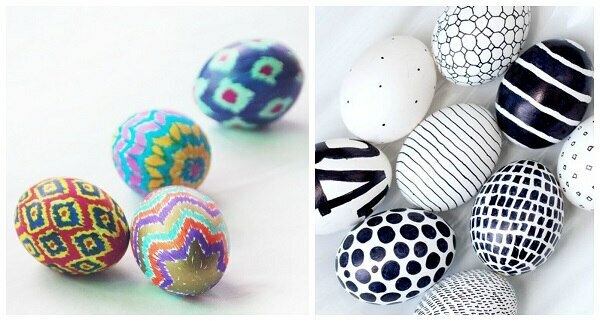 Use them to make geometric patterned Easter eggs, either inspired by colorful Ikat fabric or in modern black and white. 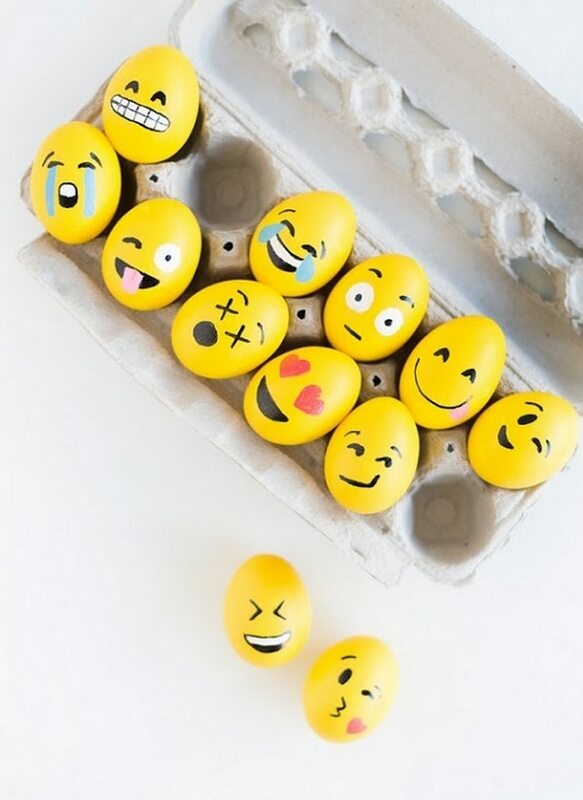 Express yourself by turning eggs into these ubiquitous emotional faces. Start by painting a yellow base, then add the individual facial features according to the step-by-step diagrams. Then smile! 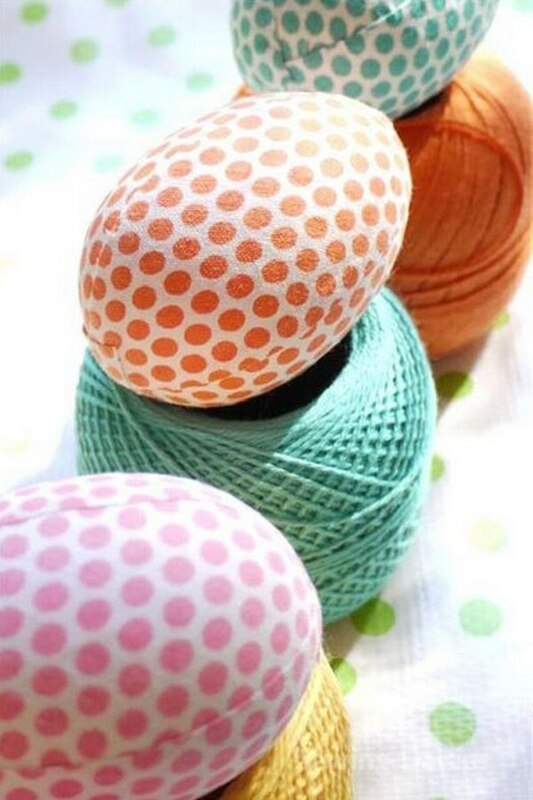 These stunning stitched eggs take some time and patience, but are perfect for those with needleworking skills. Before stitching with embroidery floss, hollow out eggshells and use a drill to create the pattern. Eggshells are really just blank canvases for your artistic whims. Decorate them with whatever doodles come to mind- faces, patterns, and abstract designs- using ink pens and permanent markers. Color may be a Spring staple, but sometimes less is more. 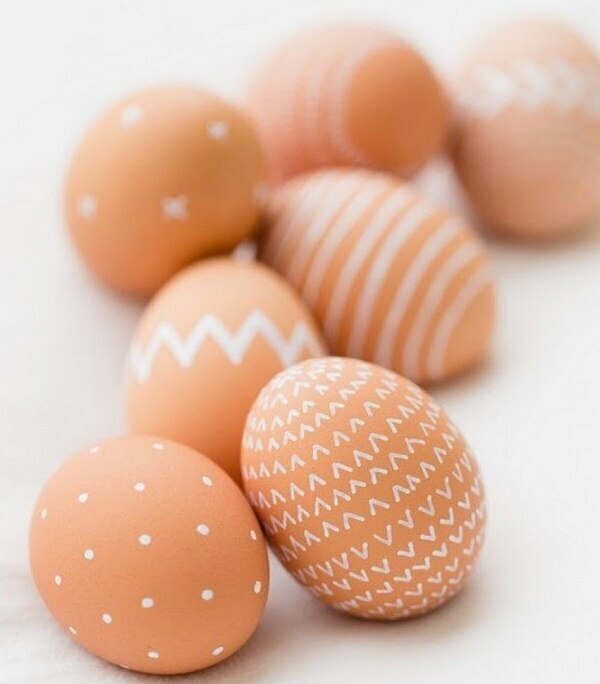 Use a non-toxic white paint pen to draw geometric designs onto natural brown eggs for a chic and minimalist batch of Easter eggs. Still have dozens of beaded necklaces leftover from your Mardi Gras celebration? 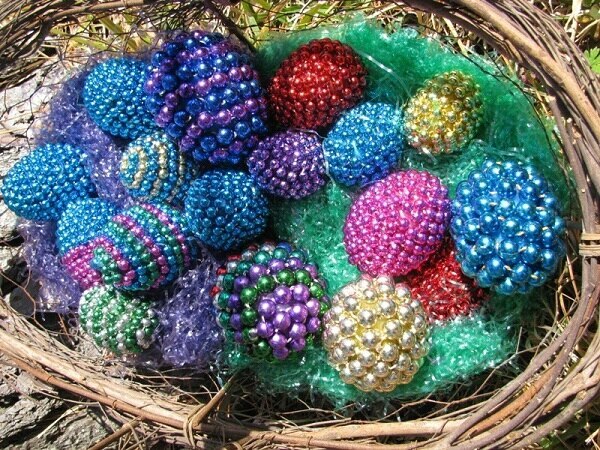 Use them to decorate eggs; simply wrap around the strands, securing with glue as you go, and trim off excess beads. 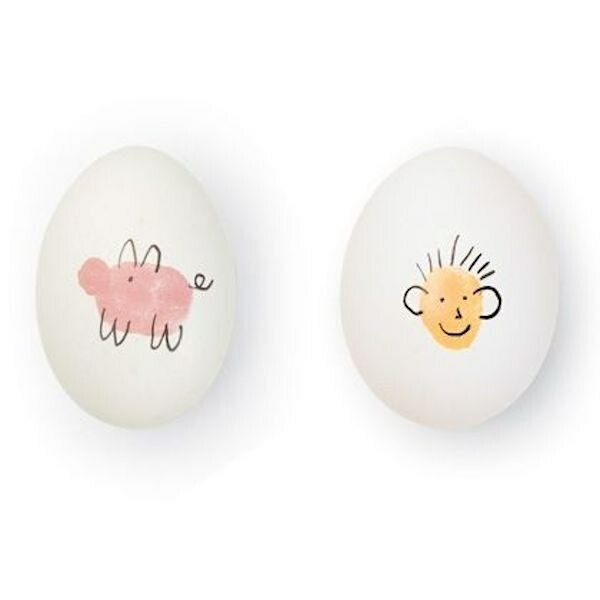 Put a personal mark on your Easter eggs with these little motifs. Start with a paint thumbprint, then add details using a black fine-tipped marker. 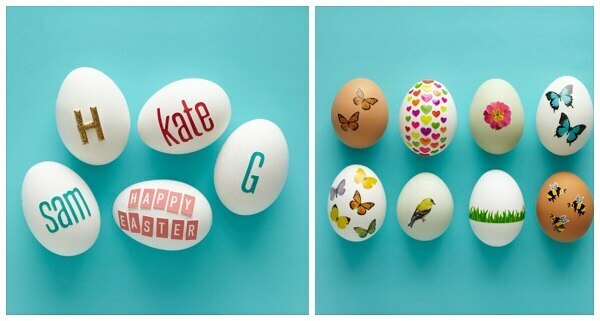 Create Easter eggs that tell a story. 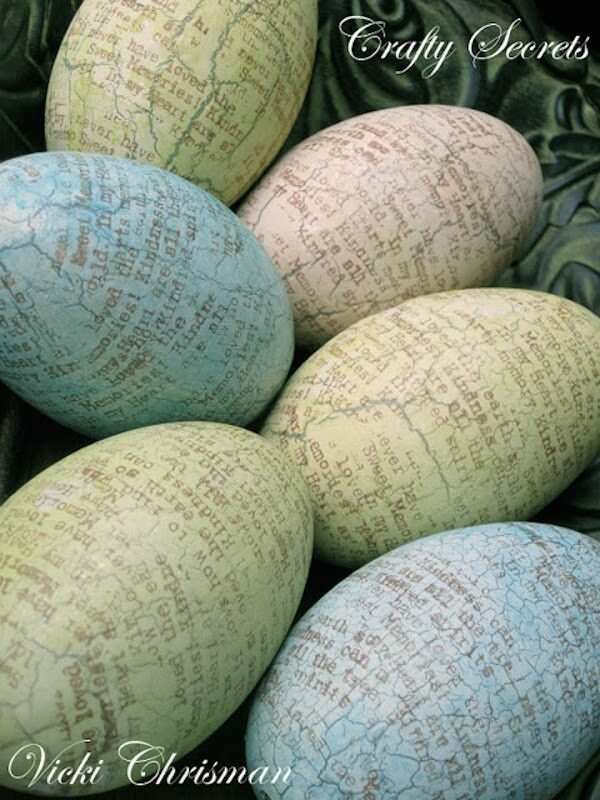 Decoupaged pages from an old book (or newspaper) on eggs puts a literary spin on your egg decoration. Chalkboard never gets old, especially when it’s used in such an unexpected way. 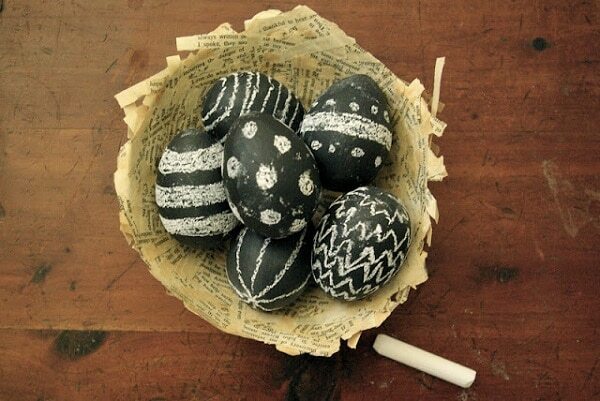 Cover paper mache eggs (or other faux) eggs with chalkboard paint, then doodle on them with chalk. 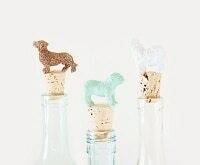 Put a party on your eggs! 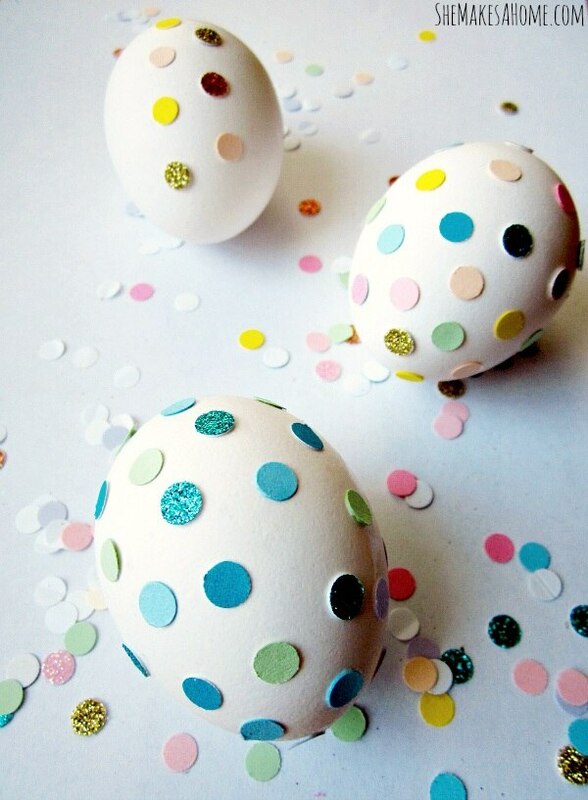 Make your own confetti out of various colorful papers and a hole punch, then glue it onto plane white shells for a celebratory spin on the Easter tradition. As far as egg decorating goes, it doesn’t get much easier than slapping on a few stickers. Use letters to spell out messages or initials, or opt for an eclectic mixture of Spring-like motifs. Why dip when you can spray? Mix and match different colors to make boldly colored and eye-catching eggs. 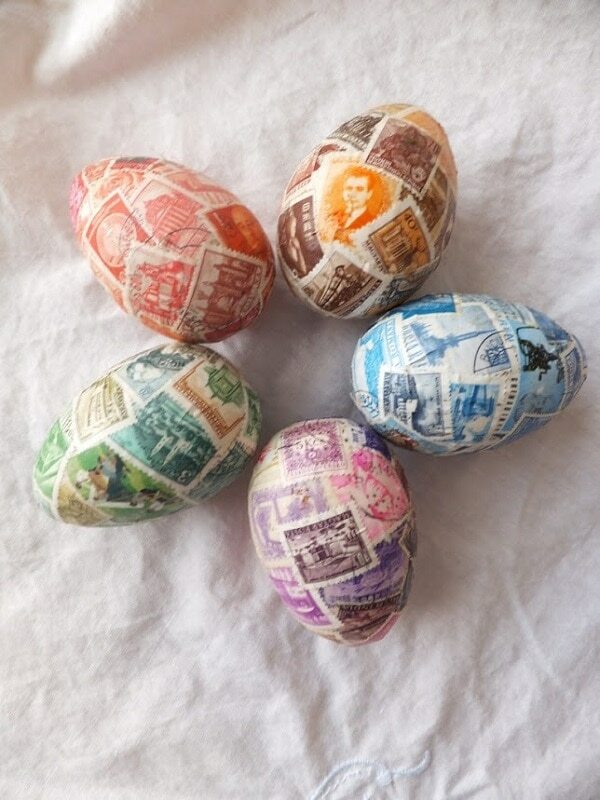 Put a unique stamp on your Easter egg decorating- literally. Just decoupage using Mod Podge. And if you’re not a stamp collector, you can find vintage ones on sites like Etsy and eBay. 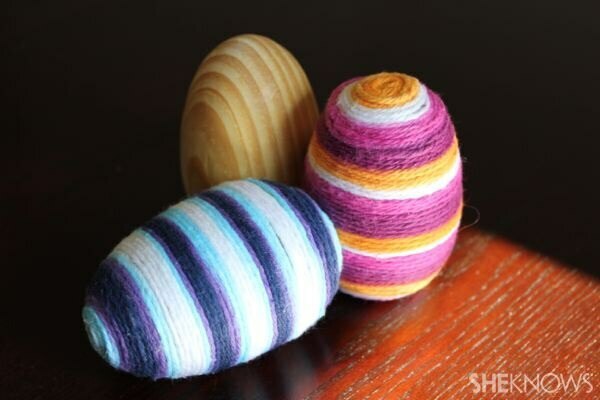 Add both texture and color to wooden eggs by wrapping them in yarn using occasional dabs of hot glue. Variegated yarn will give you the coolest multicolor effect. 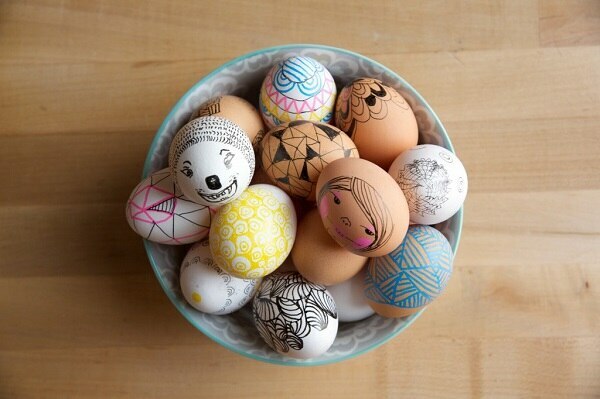 For egg decorating materials, you need look no farther than your bathroom drawer. 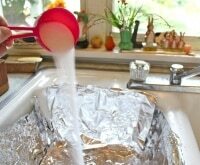 Simply add a few drops of nail polish to a bowl of water, then dip in the egg to get a marbled effect. 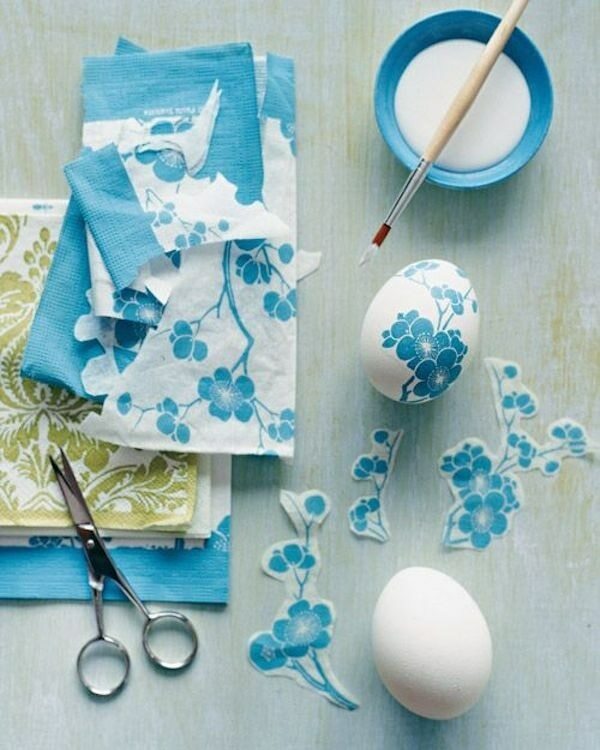 Cotton fabrics come in a wide array of colors and patterns, perfect for covering Easter eggs. For a smooth application, simply cut the fabric into leaf-like pieces, and adhere using Mod Podge. 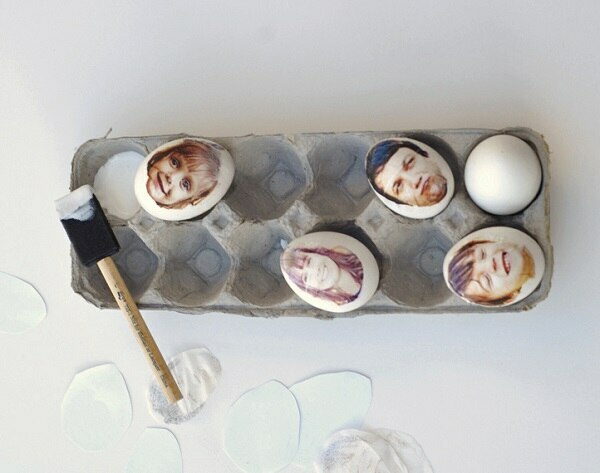 These family photo print eggs are just as sweet as they are hilarious. 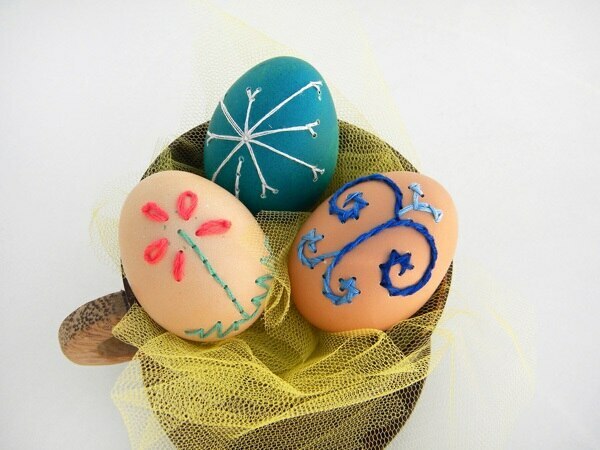 Print out pictures onto tissue paper, then adhere to eggs using Mod Podge. This one’s not for little fingers, but those with acute fine motor skills can carefully press thumbtacks into boiled eggs. 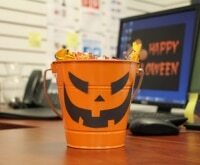 Use metallic tacks, or have fun with colorful and/or patterned ones. 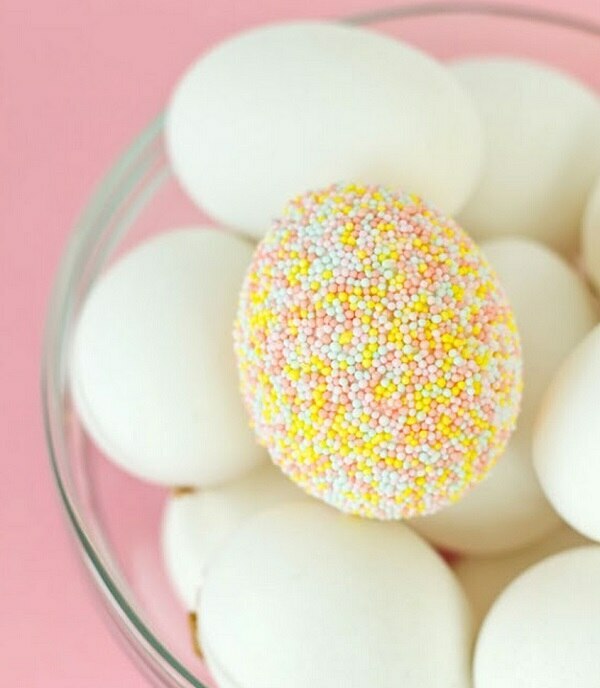 Coat eggs in glue, then dip them in colorful nonpareils for a sprinkling of color and texture. Don’t forget to press the sprinkles on with the back of a spoon so they stay put. 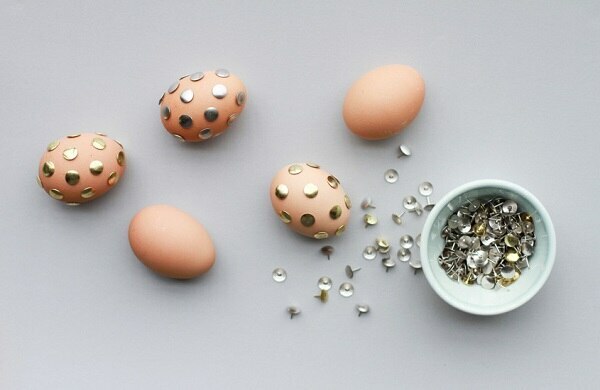 Fancify eggs using sheets of leaf metal. Simply coat the eggs in glue, wrap, and rub with your fingers to expose bits of the shell underneath. You can dye the eggs first, or let the bright white peep through. 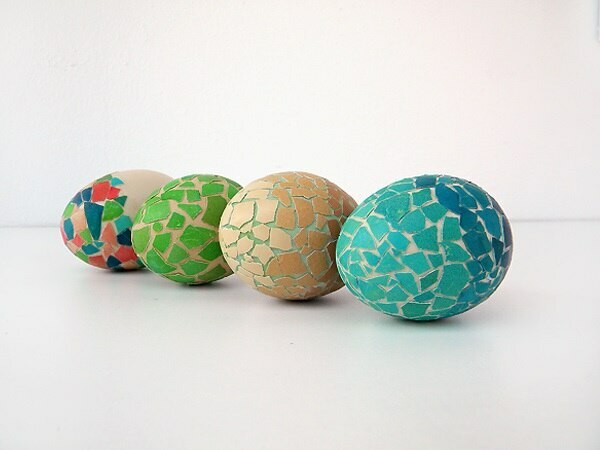 OK, these may start with a dye job, but the end-result mosaic is a stunning and original take on your average Easter egg– and they’re easier to create than they look. 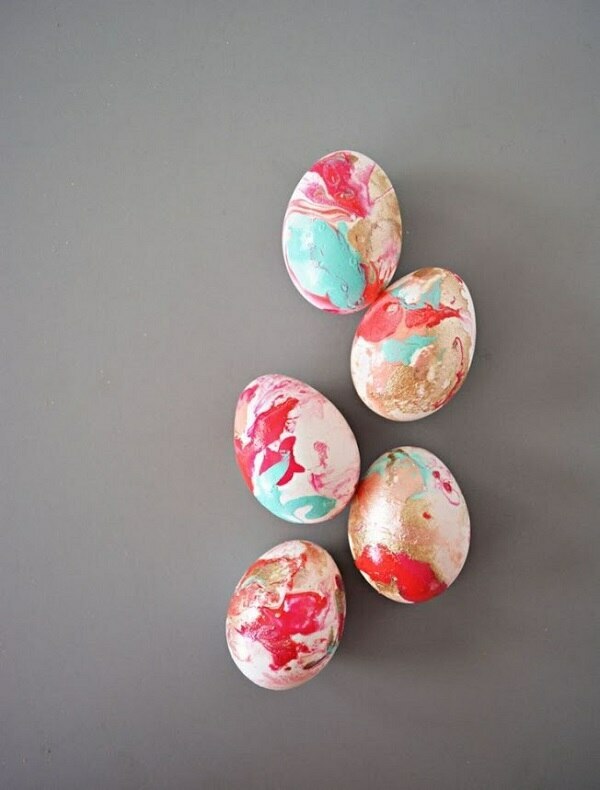 Crack colorful or undyed shells and glue them to whole eggs, mixing colors and natural hues as you wish. 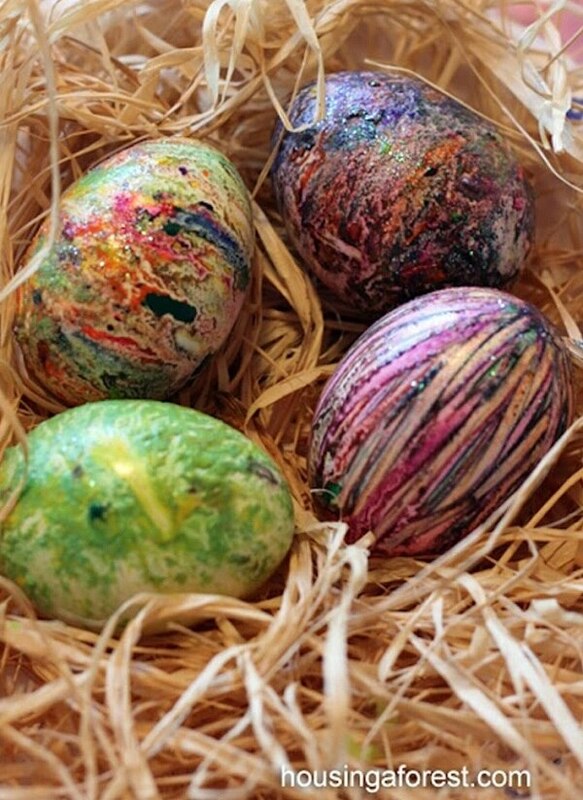 Holidays might be all about tradition, but why not try something new this Easter and take a break from egg dyeing. These decorating alternatives are original, unexpected, and many are less messy and more kid-friendly. 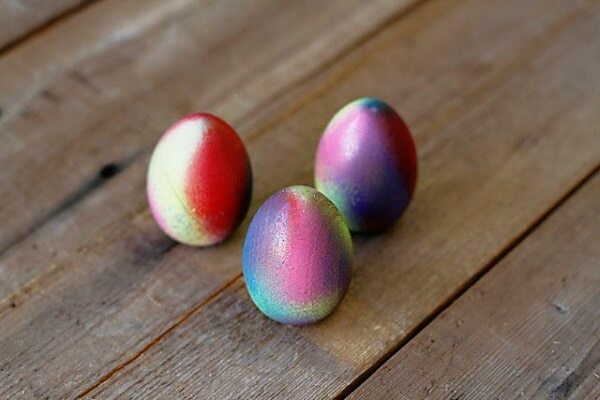 So have fun adorning a batch of freshly boiled, or decorate faux eggs and use them again next year.